New Delhi: Pune came on top in the fifth edition of the Annual Survey of India’s City-Systems (ASICS), edging out Thiruvananthapuram which had topped the previous two editions of the survey. 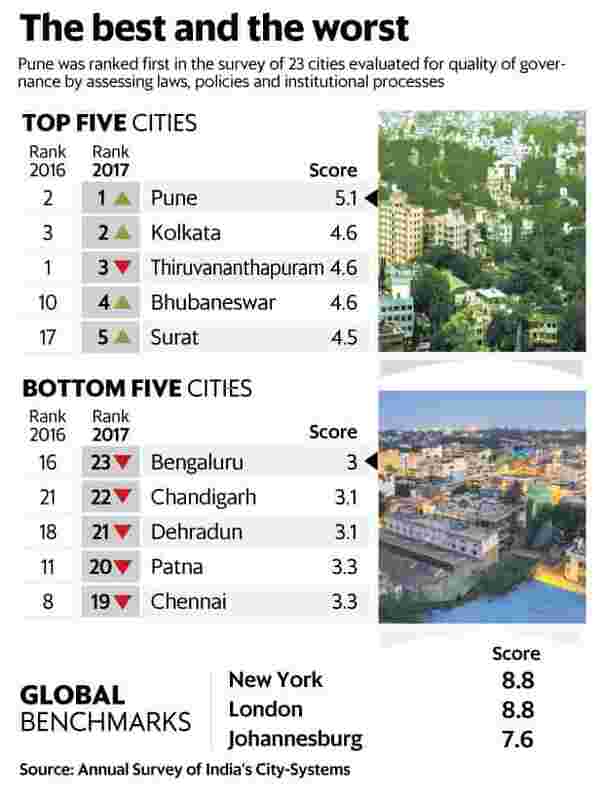 Bengaluru was ranked at the bottom. “India’s cities have virtually no platforms where citizens can participate in matters in their neighbourhood. This impacts not just municipal accountability, but the quality of democracy itself," the report said. Due to limited accountability, even the city budgets are largely “fictitious," said Srikanth Viswanathan, chief executive officer of Janaagraha. “The average variance between what’s budgeted and what is actually spent is as much as 50%," he said. “These rankings may not correlate with the pace of implementation of schemes like AMRUT or Smart Cities because the scoring framework places emphasis on structural reforms," said M.Ramachandran, a former urban development secretary.“Bringing in substantial changes in the way governance is delivered has not been a focus. The immediate priority of cities has been implementation of specific, small-scale projects," he said. In a few months, the government will release its own livability index, ranking 116 Indian cities for the first time. Unlike the proposed government index which will rank outcomes, the Janaagraha survey evaluates existing governance processes and frameworks to estimate whether good outcomes are possible in the long run. The 89 questions which the survey studied in each of the 23 cities included parameters that quantified whether a city has a centralized system of spatial development planning, adequate skilled human resources, and if city leaders are directly elected and have adequate powers.